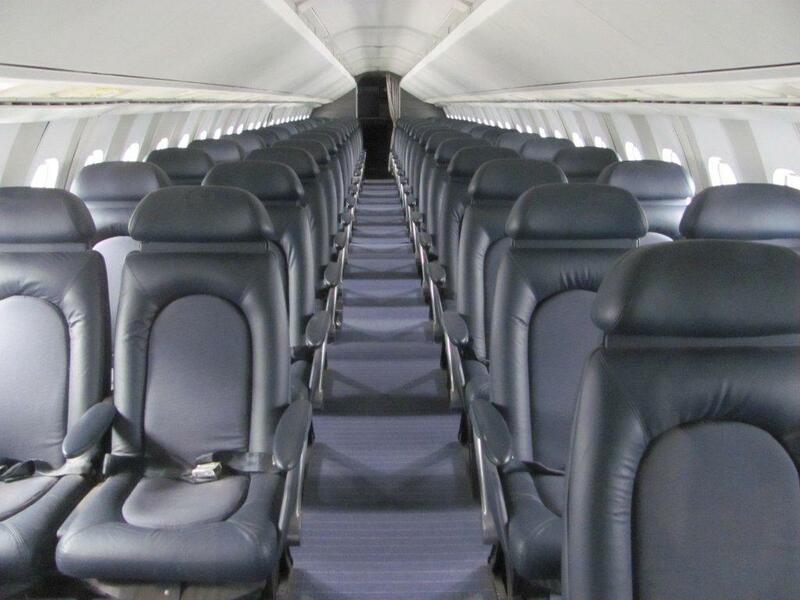 I've heard of the grapevine that the first of Eagle's Beech 1900Ds is in the Hamilton paint facility getting the "All Black" paint scheme applied. 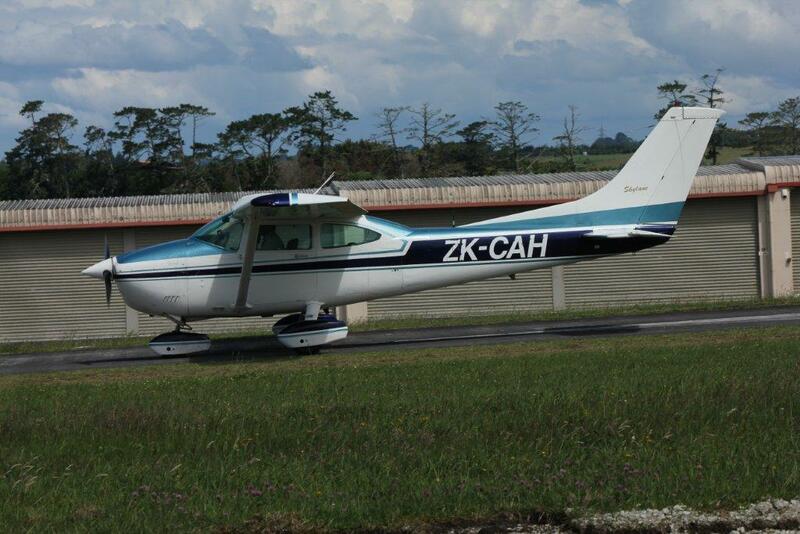 ZK-EAG is expected to be in service on the 9th of January with a second one following later in the month. A third All Black Beech 1900D is expected to be in service in the second quarter of 2012 due to time constraints. Given the New Years Honours List perhaps EAG might also be named "Sir Graeme Henry" and the next one "Not Yet Sir Richie McCaw." I hope 2011 was a good year for you and that 2012 will be even better. 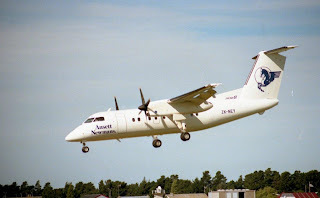 Waiheke Air (2002) Ltd was established by Michael Maguire and Cees van Heemert to operate the air service previously operated by Waiheke Airservices, which was later rebranded as Waiheke Air. This company had been grounded by the Civil Aviation Authority in 2001. As part of the airline’s bid for a new licence the company was required to restructure. Part of that process was to fill more positions on the airline board. Cees van Heemert was appointed as chief executive and positions were established to oversee quality control and maintenance. 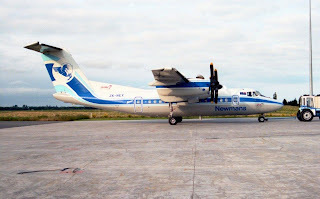 The “new” Waiheke Air operated more as a charter and scenic flight operator, though it did offer a twice daily scheduled service to Great Barrier Island. 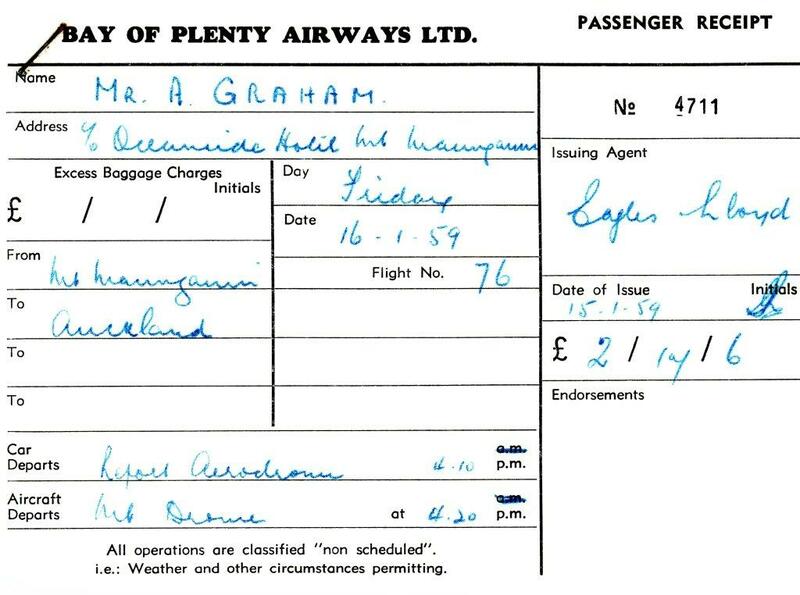 Fares to Great Barrier Island were advertised on a per seat while flights to Auckland and destinations on the Coromandel Peninsula were flown on request, with differing fares being listed which were dependent on if just one person was flying or when two or more were flying. In January 2005 Waiheke Air was grounded, this time after the chief pilot left the company. 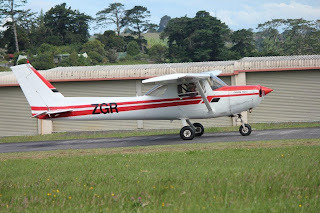 Without a replacement for the position, compulsory under Civil Aviation Authority rulings, Waiheke Air had no choice but to inform the Authority, and the CAA had no alternative but to ground the airline. For a time Mountain Air filled in the gap but the short runway at Waiheke was considered “difficult” for their Aztecs and Islanders. At the time of the grounding Cees Van Heermert told the Gulf News that “while operational requirements had technically grounded the company, the business was only just viable.” Attempts to find a replacement chief pilot were unsuccessful and by May 2005 the company had disbanded and surrendered its licence to the Civil Aviation Authority. 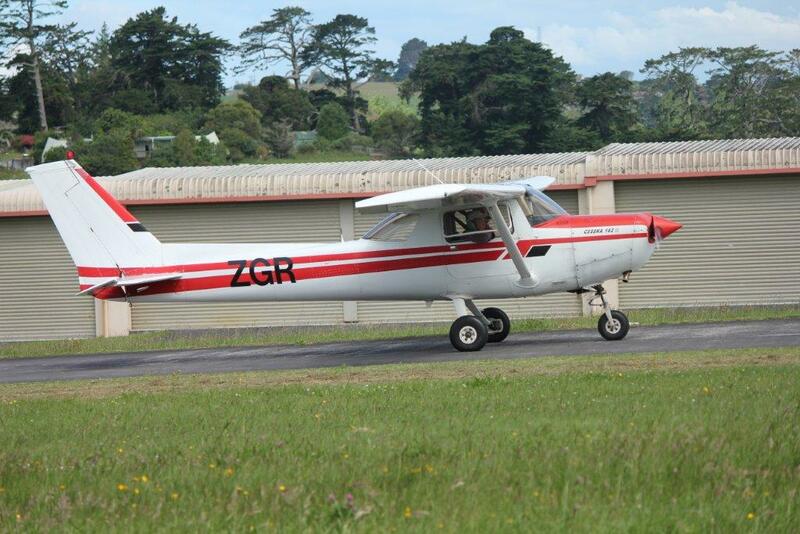 Cessna 172 ZK-PRF, taken at Ardmore on 13 October 2007. Qantas offshoot Jetstar has begun flying into Queenstown from Wellington and Sydney, with packed flights of Christmas holidaymakers. The airline reported that today's inaugural flights from the capital and Sydney are almost sold out. Jetstar Australia and New Zealand chief executive David Hall, who was in Queenstown to welcome the flights, said it was part of an increased commitment to the region since starting services there two years ago. Queenstown has been one of Jetstar's growth destinations, with the airline carrying more than half a million domestic and international passengers there in its last financial year. The airline operates 30 weekly return services to Queenstown, and with passenger numbers up 25 per cent last year, it has also recently added a weekly service from Melbourne and two extra weekly flights to Auckland. ''In total, these services have the potential to bring an additional 180,000 additional travellers into the region each year,'' Mr Hall said. The Wellington-Queenstown service will be daily and the Sydney link will run on weekdays, the airline said. Well done to the Dominion Post... Simply written - no drama to a routine situation. Emergency services were called out to Wellington International Airport after a plane was thought to have problems with its landing gear. The Air New Zealand plane successfully landed at 1.29pm. Several police cars and the fire service attended the emergency callout to Wellington Airport, after the pilot on the plane - with 60 people on board - reported difficulties with dropping one of the wheels. However, the NZ5046 flight from Christchurch to Wellington landed without any issues and the aircraft was now being checked, an Air New Zealand spokesman said. 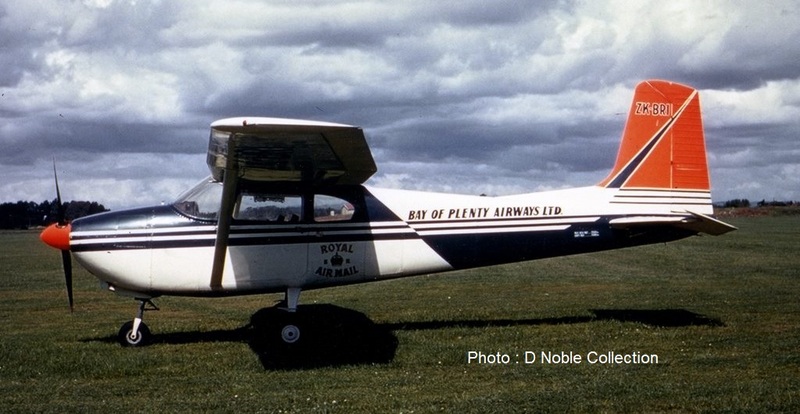 Bruce Gavin continues reflecting on Bay of Plenty Airways and, in particular, its place in New Zealand's aviation history. 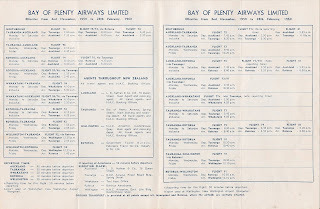 Bay of Plenty Airways Limited (1958-1961), including its predecessor Tauranga Air Services Limited (1956-1958), was a significant small airline in New Zealand’s aviation history for a number of reasons. Formed in the 1950s through the drive and hard work of Tauranga resident, A.W. ‘Alf’ Bartlett who saw that Tauranga, Rotorua and Whakatane were poorly served by air transport. Several Bay of Plenty residents supported his initiative and invested in the company. 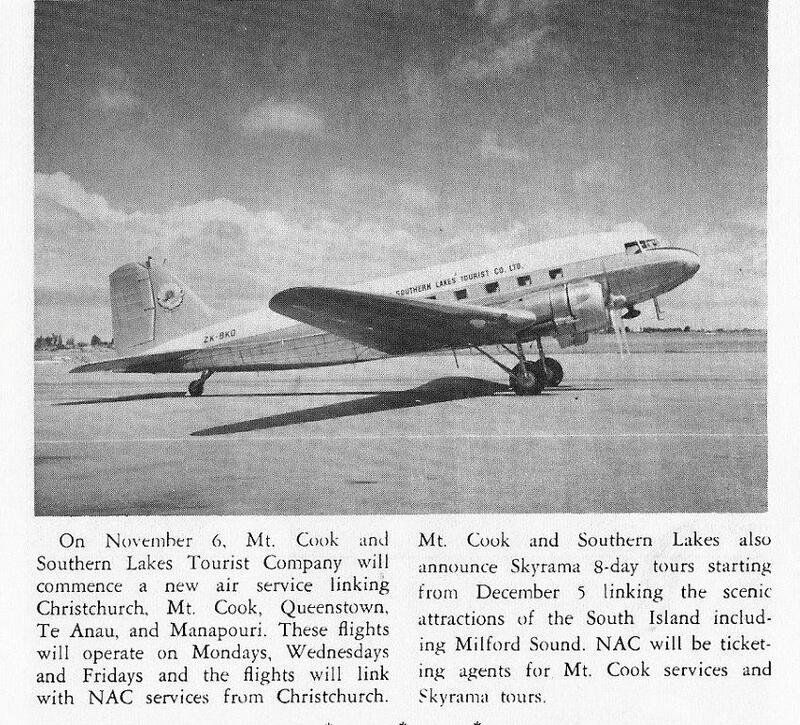 The airline built up tremendous local support with its provision of fast frequent air services from these three centres (and also Opotiki for a short time), to Auckland and later Wellington. 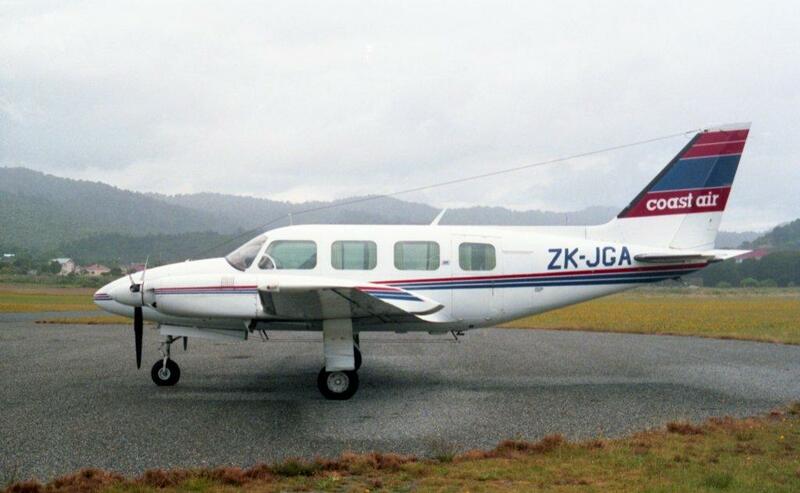 In the end the airline suffered tragedy, including the death of founder Alf Bartlett, when the Aero Commander aircraft ZK-BWA broke up in the air over Mount Ruapehu on 21 November 1961. The company was the first private New Zealand regional commuter airline to operate fast frequent multi-sector commuter air services that allowed Bay of Plenty people the opportunity to spend a business day in Auckland and return home the same day. The service also allowed Auckland people to commute to the Bay of Plenty and return the same day. 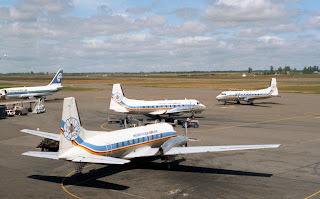 The airline greatly increased the ‘airmindedness’ of Bay of Plenty people and led to the faster development of airports at Rotorua and Whakatane. It was the first private airline to provide sustained all-weather operations using modern twin-engine aircraft with full capability for flights in instrument conditions. The airline was the first commuter airline in New Zealand to have its pilots licensed to operate regular operations by a single pilot in instrument conditions. 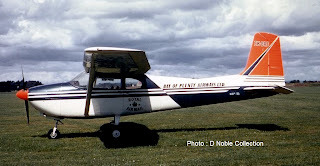 On 19 February 1961 the Aero Commander carried three parachutists (Peter Dawson, Bill Adams and Tokehau ‘Sammy’ Samuels to a height of 27,068 feet over Matamata to claim the New Zealand height record. 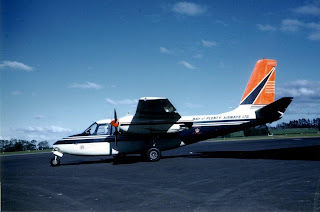 The Aero Commander [apart from NAC’s Vickers Viscounts, which were then being introduced to main trunk air routes] was the fastest aircraft on New Zealand’s scheduled air services of the late 1950s/early 1960s era. 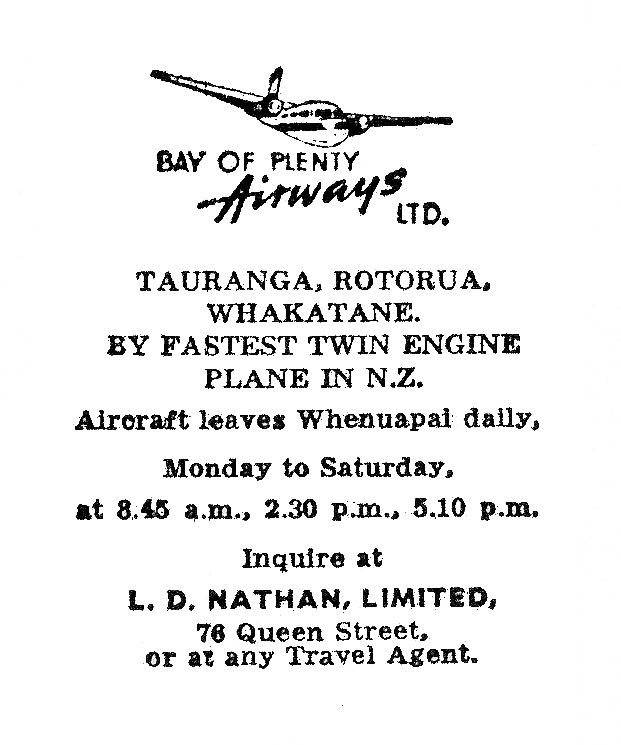 Bay of Plenty Airways was the pioneer of the direct Bay of Plenty to Wellington air route. For over four years the airline carried Auckland’s afternoon newspaper, The Auckland Star, to the three Bay of Plenty centres for same afternoon delivery to homes and shops, six days a week. The company purchased a set of runway approach lights to allow night operations into Tauranga, particularly in the winter months. The airline was approved to carry Royal Airmail on its services. 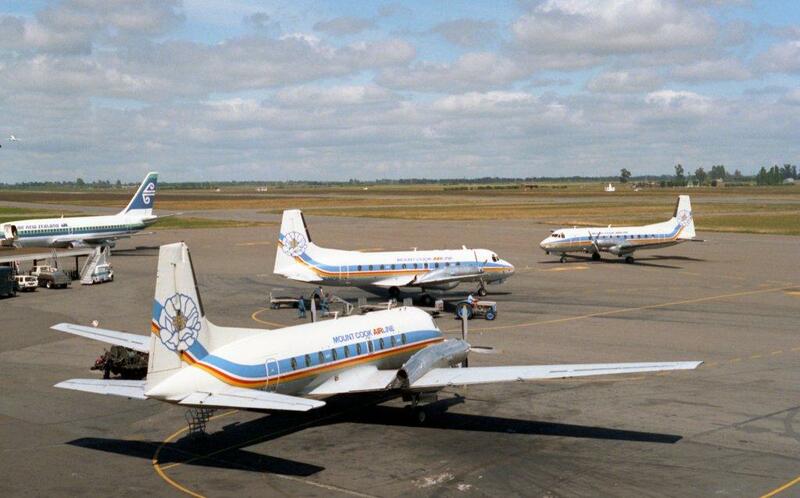 Bay of Plenty Airways was the only small private regional airline to obtain a shareholding from the Government owned national carrier, NAC. 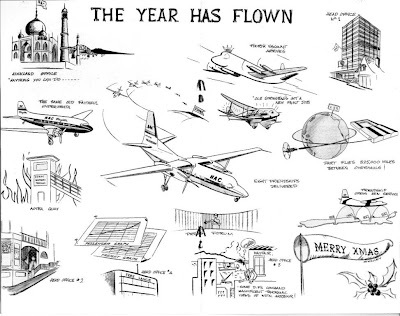 Bay of Plenty Airways was a portent of the future. After the company closed it was to be over ten years before similar regional airlines became established in New Zealand. 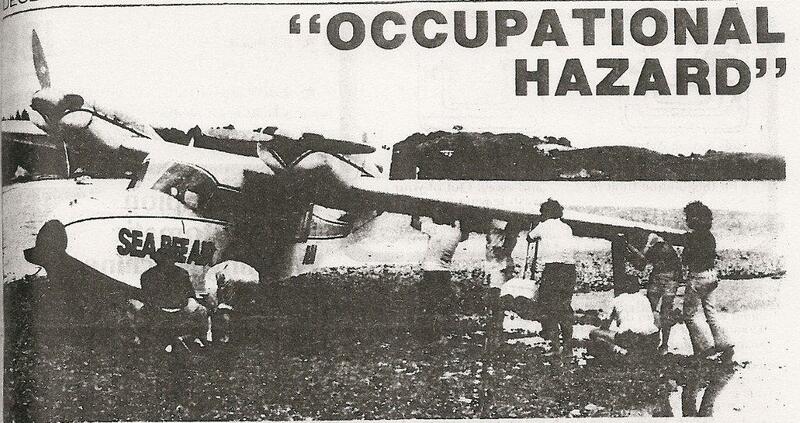 This week, fifty years ago, Bay of Plenty Airways Ltd ceased operations. This is the story of this fascinating airline as told by Bruce Gavin. 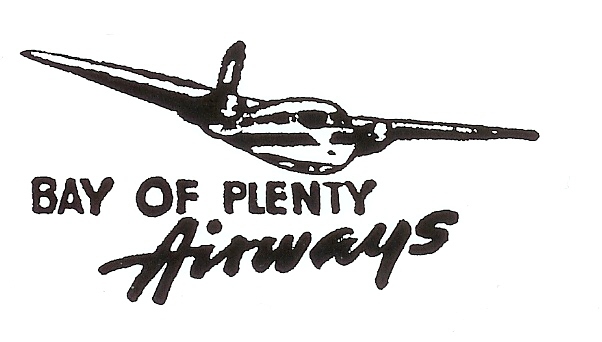 Bay of Plenty Airways Ltd was a pioneering regional airline of the late 1950s and early 1960s, which introduced many Tauranga and Bay of Plenty people to the benefits of aviation. The airline was a New Zealand pioneer in the use of light fast twin-engine aircraft with all-weather capability on frequent multi-sector services. 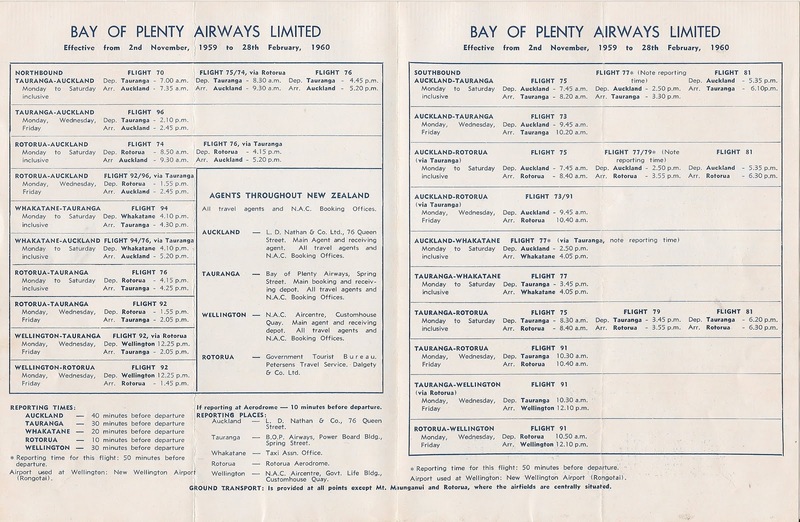 Tauranga based, Bay of Plenty Airways was a trendsetter with many of its innovations not entering general usage in New Zealand until many years after the airline had ceased operations. 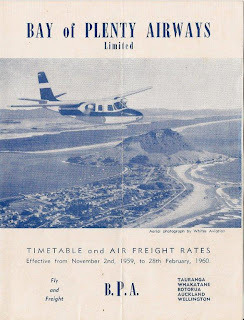 The airline took over the expanding operations of Tauranga Air Services Ltd, which had commenced air services from Tauranga in December 1956. 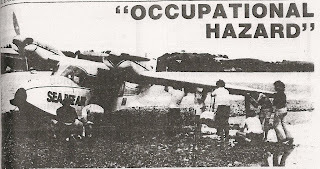 Founded by Alfred W. ‘Alf’ Bartlett and supported financially by a number of Bay of Plenty investors, Tauranga Air Services Ltd, operated Cessna 182 ZK-BRI and built up a regular air taxi service from Tauranga (both Tauranga Aerodrome and an airstrip at Tauriko), Whakatane and Opotiki to Auckland. 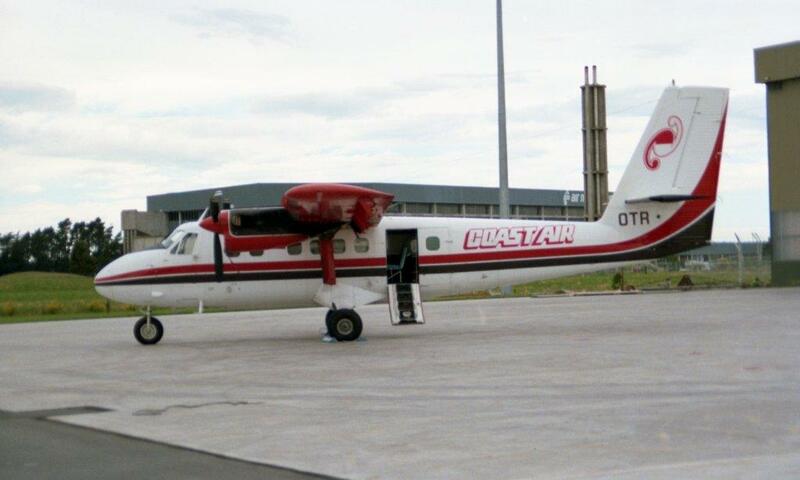 As a result of increasing demand for the service, plus the requirement to join Rotorua into the network, and to carry the afternoon Auckland Star newspaper from Auckland to the Bay of Plenty, a larger aircraft was required. 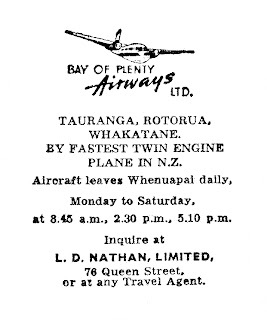 New Zealand Newspapers Ltd (publishers of the Auckland Star) provided the increased finance and became a significant shareholder in Bay of Plenty Airways. 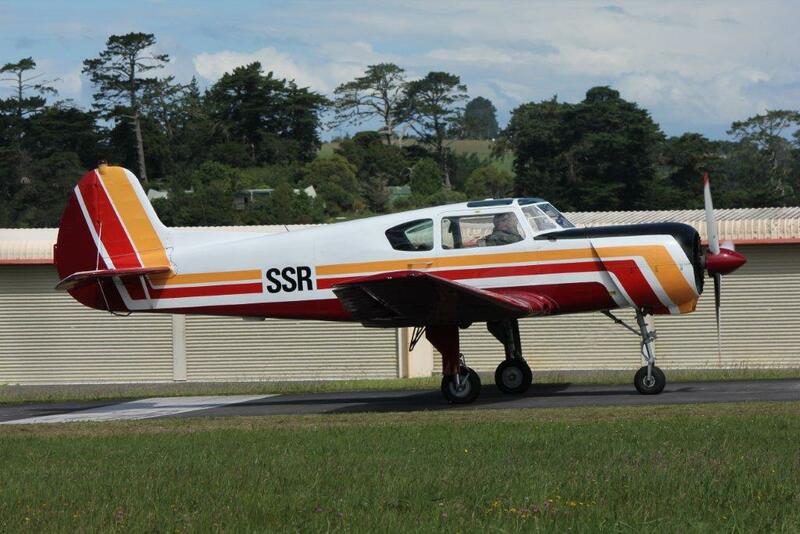 The founder and managing director of Tauranga Air Services and Bay of Plenty Airways, Alf Bartlett, travelled to the United States and purchased an Aero Commander 680F aircraft, which he ferried all the way to New Zealand. 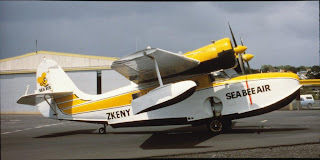 This aircraft, registered ZK-BWA (Alf Bartlett’s initials spelled backwards), entered scheduled service on Monday 10 November 1958. The Aero Commander flew the main services between Tauranga and Rotorua and Auckland while the Cessna 182 linked Tauranga with Whakatane, and for a short time, Opotiki. 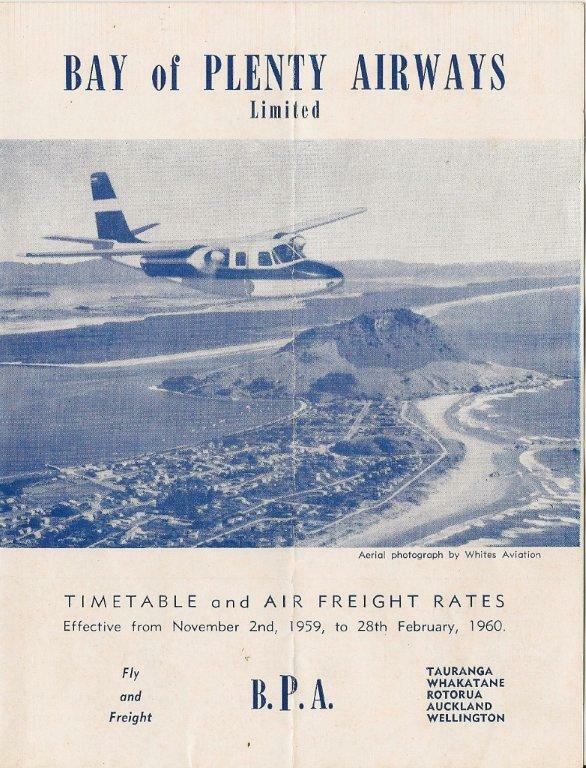 Public response was very favourable and a Tauranga to Wellington service, via Rotorua, commenced on 2 September 1959. Alf Bartlett engendered tremendous support from his staff who all worked strenuously to make the airline a success. All staff, including chief pilot Alistair McLeod, financial controller Paddy Carey and chief reservations officer and administrator Brian Head, deserve credit for the loyalty the airline built up amongst Bay of Plenty people. 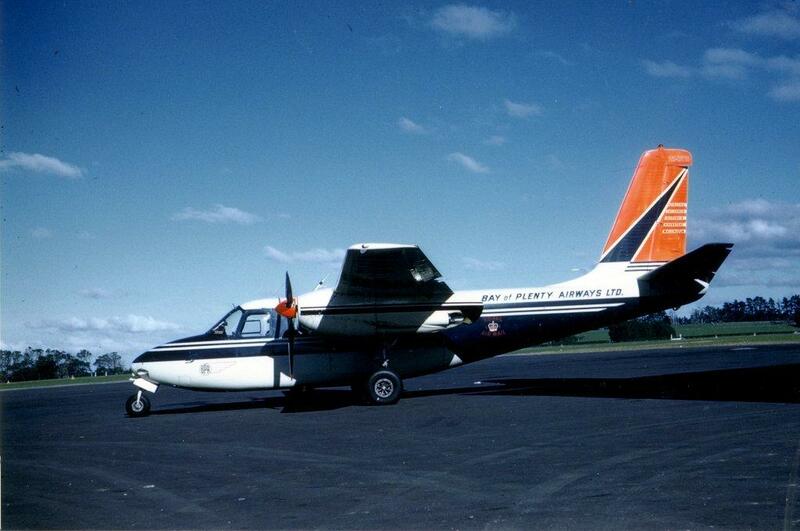 The busy Aero Commander would fly up to sixteen sectors a day and became a source of pride for Bay of Plenty people. 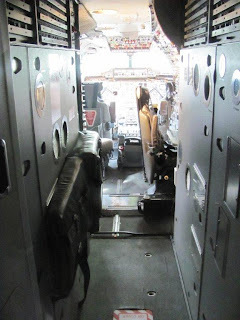 The Aero Commander was very well equipped for navigation in all weathers so to improve operational flexibility and remove the requirement to have two pilots when flying in marginal conditions, the company’s pilots underwent rigorous instrument flight training. In late 1959 approval to fly with a single pilot in instrument flying conditions (SPIFR) was gained from the Civil Aviation Administration. This was a first for a small New Zealand airline. 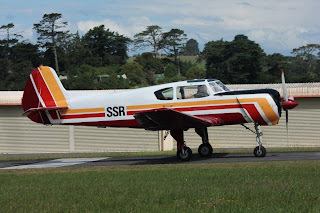 Capacity limitations with the Aero Commander, and the forthcoming availability of a sealed airstrip at Whakatane, led to the search for another aircraft in Australia. A de Havilland DH.104 Dove Mark 5, registered ZK-BZP, was imported on a three month trial and entered service on an expanded timetable on 1 February 1961. 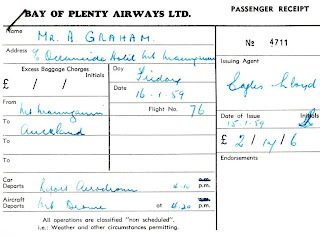 Despite all the efforts and near full loadings the airline lost money and was placed in receivership in April 1961. 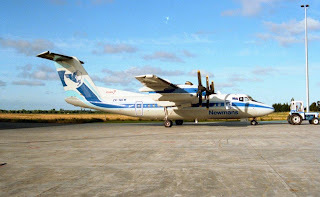 Events happened quickly and the company made strenuous attempts to gain support from Government owned national airline New Zealand National Airways Corporation (NAC). Meanwhile the private airline SPANZ made what was to be an unsuccessful attempt to take over the airline. By June 1961 the Dove was removed from service because the runway at Whakatane had deteriorated and was closed to twin-engine aircraft. Following financial restructuring one third of the company shares were held by NAC, one third by NZ Newspapers Ltd and the other third by the original Bay of Plenty shareholders. Operations designed to bring the airline into profitability continued. 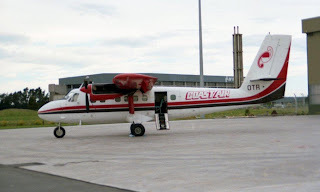 However when Aero Commander ZK-BWA broke up in the air over Mt Ruapehu on 21 November 1961, with the loss of all on board, including Alf Bartlett, the airline’s future was in peril. An interim service using James Aviation’s Piper Apache ZK-BYB, together with Cessna 182 ZK-BRI, was operated by the airline for a short time. This feeder service linked Rotorua and Whakatane with NAC’s Douglas DC-3 services at Tauranga. An Australian Piaggio P.166 aircraft, registered VH-BBG, was evaluated in November 1961 and moves were made to keep the company flying but to no avail. A decision to suspend services and wind the company up was made at a Board Meeting in December 1961. ‘Taking Off- Pioneering Small Airlines of New Zealand 1945-1970’ Written by Richard Waugh with Bruce Gavin, Peter Layne and Graeme McConnell. Published by The Kynaston Charitable Trust, 2003. Particularly Chapter 9 ‘To and From the Bay by Speedy Aero Commander’, by Bruce Gavin. Pages 142-157. 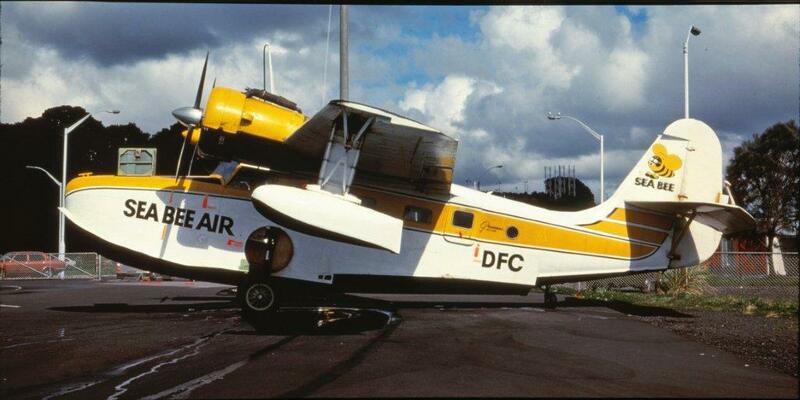 See also Appendix 3 ‘Air Crash Injustice – Bay of Plenty Airways Aero Commander’ by Professor Les Erasmus. Pages 213-219. Journal of the Aviation Historical Society of New Zealand Volume 21, No. 1 Autumn 1978. 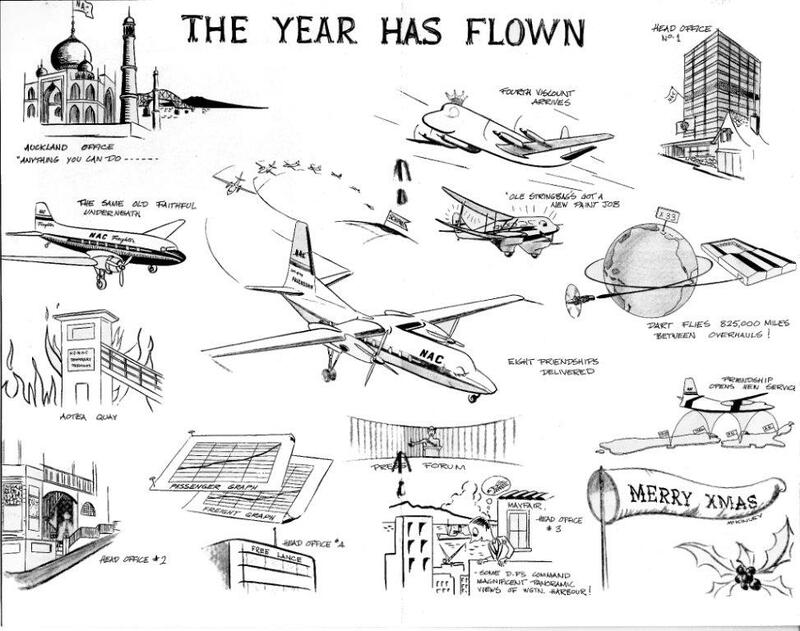 Particularly Airlines in Miniature ‘Bay of Plenty Airways’ Written by Bruce Gavin. Pages 6-8. Original research undertaken by Bruce Gavin since the early 1970s. The considerable assistance of Richard Waugh, Peter Layne and Graeme McConnell is greatly appreciated. The dinghy had sat there for three days, full of water, its dragged anchor caught in the stones. Right in the middle of the pebble runway used by the amphibians at Surfdale. For three days the plane had to squeeze past the dinghy to reach dry sand. Through high tide and low, the wretched and apparently ownerless obstacle drove the pilot to distraction. Finally after scraping the boat with an amphibian float while trying to make the beach, the pilot parked the plane, leapt out, and much to the astonishment of passengers began to remove his shoes and socks. Shirt and trousers were swiftly jettisoned also. Then, clad only in singlet and underpants, the intrepid pilot plunged into the chilly Surfdale waters to struggle with the obstinate waterlogged dinghy. After several minutes of suspenseful battle the dinghy yielded and was dragged to one side. Then, still in dripping underwear, the victorious pilot flew his admiring passengers back to Auckland, having overcome yet another occupational hazard. 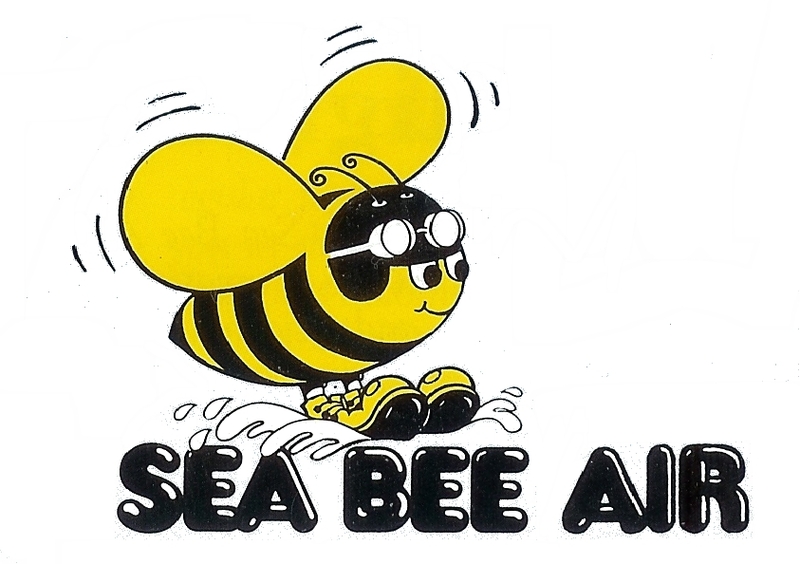 An "occupational hazard" stranded the midday Sea Bee Air flight in the mud on Surfdale beach last Friday. The Grumman Widgeon was finally freed two and a half hours later after concerted efforts by four engineers and a group of game bystanders. The engineers were whisked over by jet boat from Mechanics Bay after Chief Pilot Norman Sanson radioed 'that he had judged the width of the stone ramp a little bit to finely. Using wooden planks and blocks commandeered from Walker & Lewis, the impromptu work gang heaved the one-tonne amphibian out in 30 minutes. "This has happened twice to me in four years," Norman reflected. 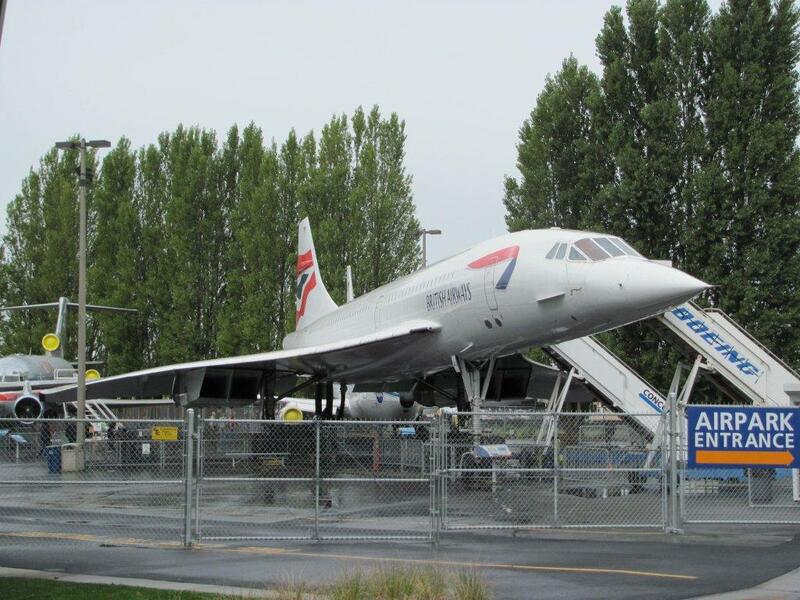 "It's always a possibility, because of the lack of ramp facilities here," The airline would be a lot happier, he added, if it was allowed to use the bitumen hard-standing area 100 yards east of the present ramp. It was unfortunate that residents had not favoured the idea in the past, as the bitumen provided an ideal turning-circle. Sea Bee have never asked the Council to improve the present ramp, but general manager Murray Pope informs us that he would certainly be receptive if Council made the initial approach. "Last month we spent $110 putting more stones down… obviously the rarrip needs more,” he commented. Mr Sanson feels a good case for Council assistance can be made. He pointed out: "Air New Zealand doesn't have to build a runway in Australia!" At Whangaparapara halfway up the Island there are the remains of an old whaling station. The plane lands there on the water then runs its left hand wheel onto a small beach and swings sideways – this means the wing swings across a small grassy bank at the side of the road. A wooden plank was then placed between the door of the aircraft and the grassy bank to board. No, it's not quite "goosey, goosey, gander", more a case of "Goose, Goose, Turbo Goose." 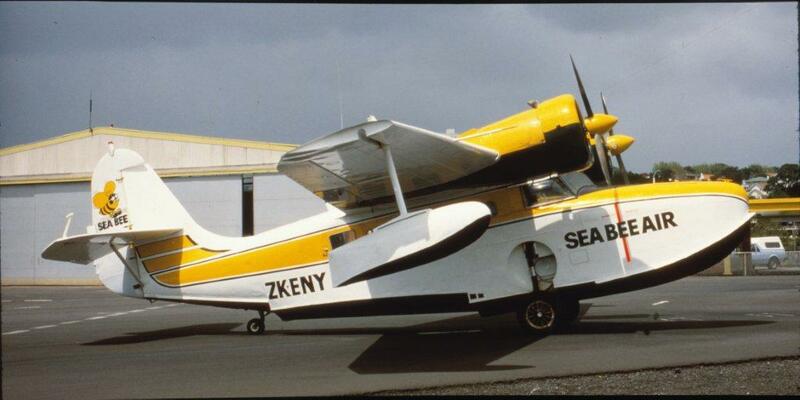 I was sent these stunning photos of Sea Bee Air's 3 Goose aircraft taken by the late Colin Ballatine. The three photos were taken at Mechanics Bay... Only the photo of DFC was dated; it was taken in September 1980. And dropped him at Paihia.